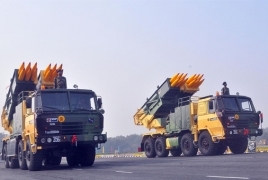 PanARMENIAN.Net - Armenia has expressed interest in obtaining the Pinaka rocket system developed by India's Armament Research and Development Establishment (ARDE), which is a laboratory under the Defence Research and Development Organisation (DRDO), Times of India reports. Several foreign delegations, including Armenia, had visited the defence expo at Chennai this year. “Southeast Asian countries have also expressed an interest in the Pinaka system, but they are yet to officially approach the Indian government,” said a senior scientist of the ARDE. The Pinaka is an indigenous unguided rocket system which has been undergoing elaborate tests for the last 20 years and is capable of neutralizing large areas with rapid salvos. The Indian army extensively used the systems during the Kargil war. The laboratory is all set to carry out technical trials of the newly developed guided Pinaka missile, which has a range of up to 80km, at Pokhran and Balasore in Odisha next month. “We will check the accuracy and range capabilities at the Pokhran and Balasore facilities. During these trials, our focus will be on achieving pinpoint targeting, which is an essential requirement. Thereafter, the army will carry out its own trials of the rocket before accepting the system,” said Rajan, adding that the DRDO plans to operationalize the new version by 2020.